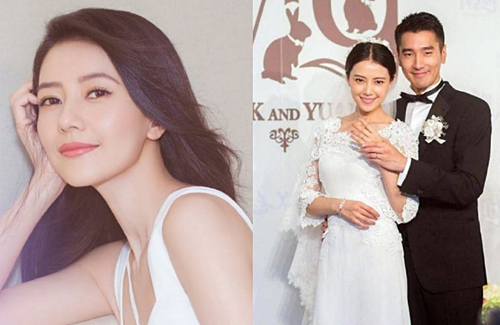 After five years of marriage, Gao Yuanyuan (高圓圓) and Mark Chao (趙又廷) announced that they’ll be welcoming a baby into the family. Although Yuanyuan was rumored to be pregnant many times in the past, Mark finally had good news to share today on his Weibo account. Thrilled that the couple will be starting a family of three soon, fans tried to guess when Yuanyuan became pregnant. Earlier, when Yuanyuan attended a brand event and appeared on screen with a rounder face and had her belly covered the entire time, netizens already began sending their blessings. Netizens then dug deeper and thought back to when Yuanyuan was absent from Alyssa Chia (賈靜雯) and Xiu Jie Xie’s (修杰楷) wedding last November due to an expired passport. While the excuse didn’t seem out of the ordinary at the time of the wedding, fans now speculate that perhaps Yuanyuan wasn’t fit to fly in November because she was already pregnant with the baby. Then last December, Yuanyuan was also absent during another wedding and Mark ended up going solo. It was said the 39-year-old actress was most likely resting at home because of her pregnancy. Congrats to the couple…wonder when’s their expected due date. @littlefish so many piggies to look forward to this yr! @coralie 2019 seems like an auspicious year to have babies. Kevin became a father…next will be 4th prince Nicky Wu, Myolie, ruco chan. Congrats to Mark, Gao Yuanyuan, happy to know that you’ll soon expect a little one to join the growing family. I’m confused though, it wasn’t too long ago, a bit after they were married, wasn’t she expecting back then? I thought she would’ve had the baby by now since it was stated how she was pregnant back then? Hope all is well, good luck.